Location: Rosslyn Dimyat hotel Varna ex. 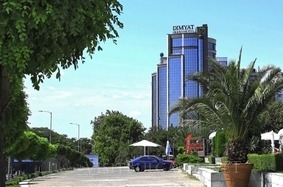 (Swiss Belhotel and Spa Varna, ex. Grand Hotel Dimyat) is located in the centre of Varna, 500 m from the beach, next to the Sea Garden and the Palace of Culture and Sports. Accommodation: The hotel offers 4 single rooms, 69 double rooms and 1 suite. The guestrooms are fully furnished and offer air-conditioner with individual control, satellite TV, free Wi-Fi internet access, safe, mini-bar, telephone in the room and in the bathroom, bathroom with shower cabin or bath-tub, hairdrier, terraces with view over the sea and the Sea Garden. SPA centre: The SPA centre offers indoor swimming pool (1.40 m depth), Jacuzzi, aroma steam bath, Finnish sauna, adventure showers, relax zone, kneipp, diverse massages, face and body therapies, hairdresser, water aerobic, manicure & pedicure. Wine and Dine: The main restaurant with sea view and 120 seating capacity serves dishes from the Bulgarian and international cuisine. The restaurant offers banquet hall for weddings and different parties and events. There is also a lobby bar. Conference facilities: The property offers a conference room with 140 seats and a banquet room for up to 250 guests for different events. The Conference room is located above the mezzanine, next to the main restaurant and the Banqueting Room. It offers a separate entrance, all necessarily equipment and natural daylight. The hotel offers a business room with 30 seats, natural daylight, Wi-Fi internet, multimedia, projector, flip-chart, etc. Free parking lot is available for the hotel's guests.